It has been a very uneventful week which is fine by me. The weather here has been absolutely beautiful but I am sorry to say that ragweed is pollinating which has made me a sneezing mess. If you sign up for one of my correspondence courses and you don't hear from me within 2 days or so, assume something is wrong and contact me or TKGA. I send out links to the materials as soon as I hear from the TKGA office. There are four emails with the files. If you don't get all four, let me know as soon as possible. I prefer to send links as sending the actual files can take a really long time due to the graphics. When you send me a lesson, I review it the day I get it and put it in the next day's mail. Depending on where you live, you should have it back in a day or two. I indicate here or on Ravelry when I will be out of town. A neighbor takes in my mail and so far (knock on wood) only one lesson has been lost. There are many reasons for uneven tension and I've discussed ways to approach the problems in the past two weeks but those aren't the only reasons or solutions. It is a very complicated issue and there is not a "one size fits all" way to fix it. Some yarns contribute to tension issues. Another thing to consider is the needles you are using. 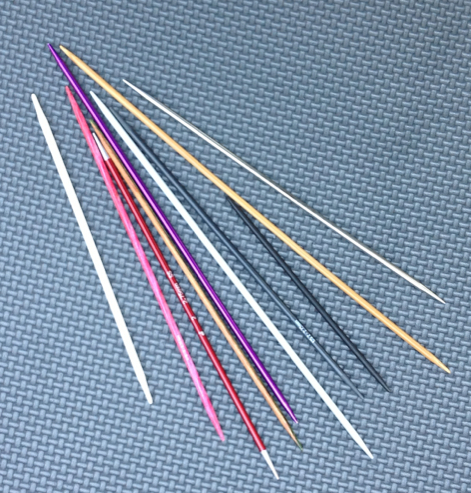 I have been knitting for a long time and I have used pretty much every type of needle and I have discovered that I have a preference for uncoated metal needles with very pointy tips. This is my preference and I would not ever make the suggestion that my preference would work for everyone. When I first started knitting I was at a yarn store and a fellow knitter seeing my Boye needles sneered and said, "Serious knitters only use bamboo needles." If you ever meet a needle snob like this one, run in the opposite direction. What works for one knitter may not work for another. By the way, I rarely use bamboo as they tend to slow me down (which has a detrimental effect on my tension) and they aren't pointy enough. (I also tend to snap the smaller sizes). Carolyn, one of the co-chairs of the Master Hand Knitting Committee shared a story with me that when she got back her Level 3, she was dinged for tension issues at the selvedges. She had used plastic needles instead of the ones she had used for Levels 1 and 2. She switched back and the problem was solved. Figuring out which needles you like best and which gives you the best results might take some experimentation. This can get expensive. If you are lucky enough to be in a knitting group, consider borrowing different types for a test drive. Keep in mind that you may want to use different types of needles for different yarns and stitch patterns. If I am knitting with really slippery yarn, I use needles with more drag (like bamboo). If I am knitting lace or cables, I want the pointiest needles I have which are the Signature Stilettos. One thing we frequently see in the Masters Program is that some knitters will use much smaller needles than recommended for the yarn. Yes, this does improve tension for most knitters but the resulting fabric could be used for roofing tiles. This doesn't fool anyone. In the photograph above are two gauge swatches I worked for a pillow project. I wanted the fabric for the back of the pillow to be more like upholstery fabric to reduce the stretch. I used needles 4 sizes smaller. I would never use needles that size for that yarn if I were knitting a sweater. The fabric would be too stiff. Knitters who use patterns don't need to worry all that much about this. The pattern will suggest the needle size to get the desired drape and as long as you use a yarn of the recommended weight you should be fine. 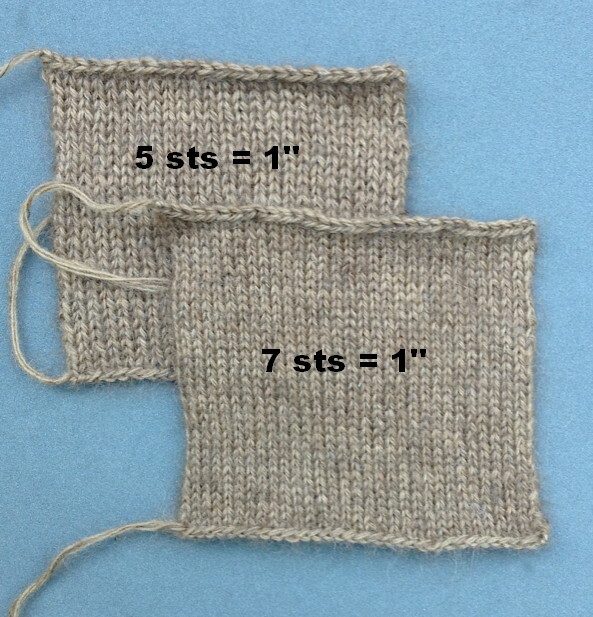 In the Basics class and the Masters program, knitters aren't told what needle size to use but rather an "appropriate" size for worsted weight. You will know it is an appropriate size if the resulting fabric has a nice drape or hand. If it looks like lace, you are using needles too large. 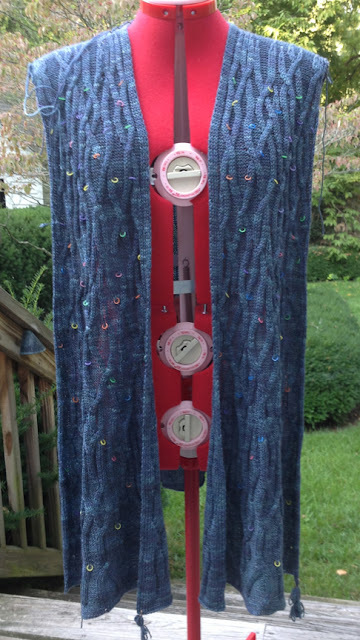 If the swatch will stand on its own, you are using needles too small. Salon will be on Saturday from 2-5pm. I only have about 1" to go until the sleeves are finished for my Medusa sweater. I thought it would take much longer. I should be able to block them today and sew them in tomorrow. I have sewed the fronts to the back and finished the neckband. One of the great things about this yarn is that there is 800 yds in each skein. That really reduces the number of yarn tails to weave in. It is going to take me a while to cut out all of the dental elastics I used to mark the decreases. 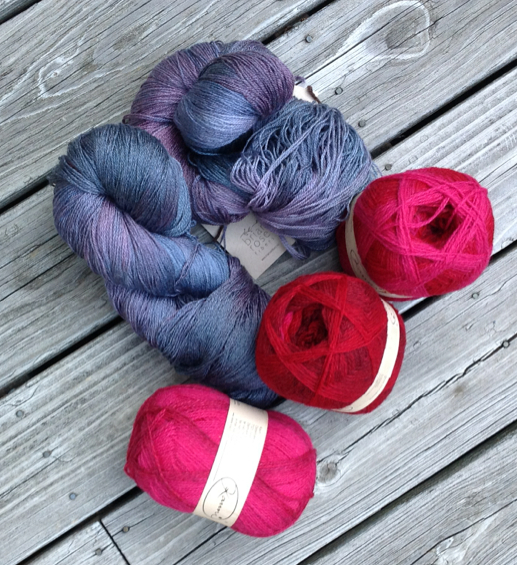 I've received the yarn I am going to use for the skirts in the next issue of Cast On. I was hoping someone on the committee would want to do the Fashion Framework article on skirts. No such luck. Since skirts require so much knitting (particularly for tall models!) I am getting a jump on the project. The purple blue Briar Rose will be for the skirt in the lesson. The Kauni will be for a side-to-side garter stitch skirt that uses short rows for shaping. I should be able to get started by the end of the week. I want to finish the second sock for the pair I started weeks ago. Actually, my Swatch 1 for Level 3 never made it to the committee. It was horrendous, and I knew it needed to be fixed before I sent it off. Two days and much angst later, the problem was solved with the needle change. Phew! The committee liked the swatch 1 I sent in. 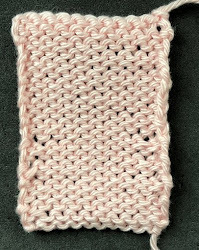 It was my invention of an inch of stockinette before and after the Entrelac portion of one swatch that they wrinkled their noses at. I was *sure* the directions wanted an inch border on that swatch!!! con Bạch hùng thủy hệ, cộng với tàn quân không đến mười vạn slime . Trận chiến này đã làm cho kế hoạch xâm lược của Nam hải trở thành bọt nước . hâm mộ thế giới đáy biển sao chớ ?